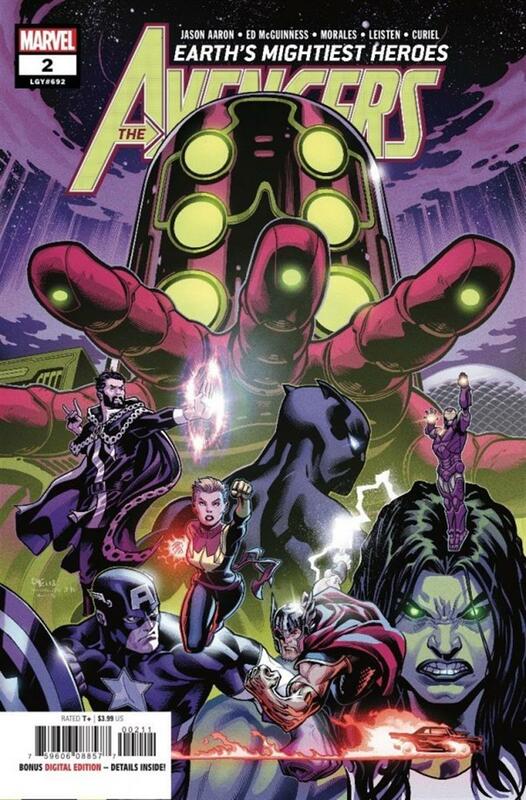 In his second Avengers issue, Jason Aaron turns Ghost Rider and She-Hulk into another pair of bug-fighting b-listers to match T'Challa and Doctor Strange, shows the Big Three accomplishing a whole lot of Not Much, and shoves Loki onto the stage as the key antagonist. Loki provides sneering commentary from start to finish, and by the end, it's clear he's almost sexually thrilled at the opportunity to be (again) the villain we all love to hate. He's also our go-to source for tiny nibbles of "what the hell is going on here, really?" info. These morsels are appreciated, but they just don't do much to satiate our hunger for understanding. Stellar visuals are still this title's strongest selling point. Inker Jay Leisten is a welcome addition to the team, and he blends seamlessly with Mark Morales. Ed McGuinness's art is still bold and brassy and his double-page spreads are so packed with energy they feel like snapshots of an action-packed world that extends a considerable distance beyond the margins. David Curiel's colours are also top-shelf work all the way. He does an impressive job of integrating almost neon-bright action into nighttime settings, and he textures up the panels where Mr. McGuinness doesn't provide background very well. There aren't that many of them, and Mr. Curiel ensures that they aren't at all disappointing. The art team really has to lift a heavier load here than in the last issue, partly because Loki's narration tends to fly off on tangents while really exciting ☠☠☠☠ is happening in the panels. The artists do a superb job of telling the story on their own when they have to. But we've got to talk about the other reason the art team finds itself with this challenge. While his past work gives me all the confidence in the world in Jason Aaron's ability to tie an epic story up in a sensible bow once it's completed, here at the outset of one, we desperately need compelling characters to hang onto. And on that score, Mr. Aaron's Avengers seem to be missing the mark. Thor is clearly Thor, no surprise there, but Cap and Iron Man still read like shallow parodies. There are similar difficulties with most of the supporting cast. The surprise hits of last issue's roster, Doc Strange and T'Challa, are completely MIA this time around. I'm not too familiar with Robbie Reyes, but I'm pretty sure he's gotten past the "crap your racing suit in terror" stage of hero-ing. Jen's portrayal here, grappling with an uncontrollable Silver Age rage-monster inside her, ignores all of the good work Mariko Tamaki did in Jen's last solo volume. Angel's Advocate: Characterization problems aside, the sight of Jen going green when confronted by mysterious murder-bugs and delivering an epic "HULK SQUISH" is satisfying on multiple levels. Funny, satisfying, proactive, and drawn with consummate skill. Captain Marvel is still doing a good job of lowkey upstaging the Big Three by showing way more initiative and cunning in round one of the Celestial fight. But her trick for this issue, deploying a Flash Gordon superweapon that we know won't work, is a non-starter. Carol Danvers' problem is the problem that the title as a whole is grappling with: These first-act efforts are doomed to failure, and we're reduced to waiting patiently for the plot to chug along to the point where the heroes can start hero-ing. But we don't get quality character work or revealing plot developments to occupy us while we wait; we have to make do with eye-popping visuals and kiddie-pool-shallow takes on a hero roster whose lack of individual charisma and collective chemistry is becoming a serious fault. Even more than in their debut, Jason Aaron's Avengers are marking time in #2. While I'd still put my money on this developing into a satisfying epic once the arc is complete, it's just not compelling in single issues. Holding back on this title and gobbling it down in trade-sized chunks might be the best way to approach it. This title's surprise Legacy throwback? Thought balloons. Now we just need to figure out why Robbie Reyes seems to have exclusive rights to using them.